Almost all of the features can be activated/deactivated in the settings of the script. You can use the contact form to report bugs or to give feedback. 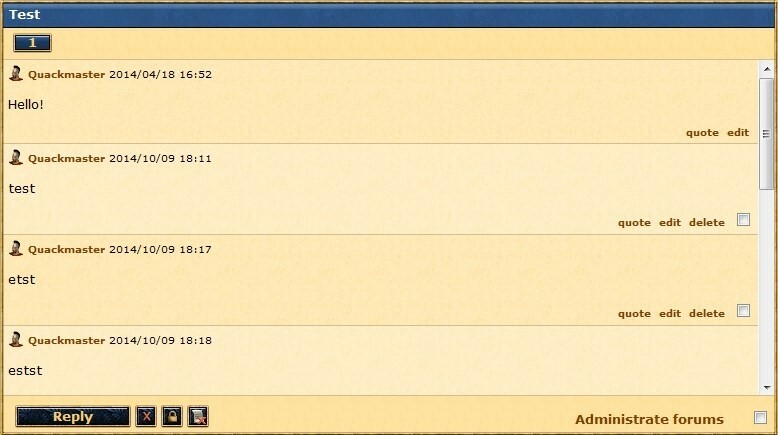 The width of the forum is automatically increased so that all subforums are visible. Furthermore you can select multiple posts and delete them with one click. The design is improved and many features are added. After you farm a city on an island, all other cities on this island get hidden (this can be prohibited by clicking on the golden eye in the headline of the townlist). Cities can also be hidden/shown if you click on the name of the island. A checkbox shows you if you have already farmed an island or not. Furthermore you can switch cities by using the arrow keys of your keyboard. The script remembers your last chosen farmoption as well and will select it automatically for you. 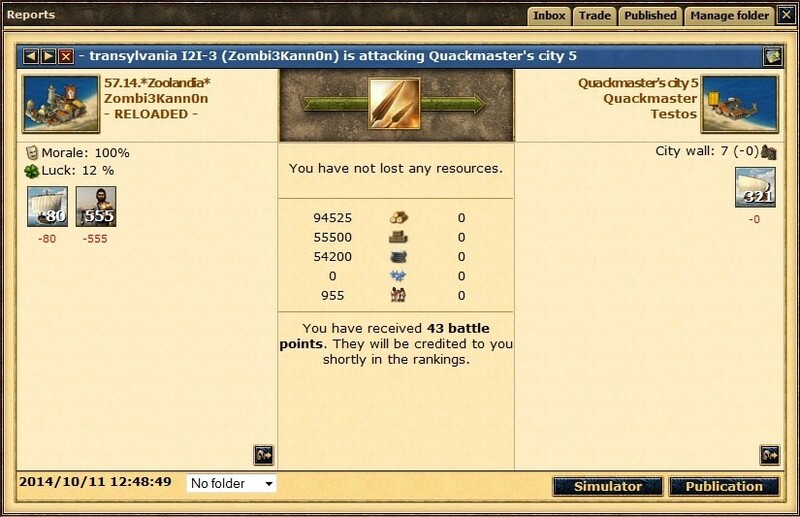 Resources, favor and population are calculated for lost troops. You can see an overview for each unit type if you hover over their image. Report folder are sorted by their name instead by their internal ID. Reports are highlighted with different colors and can be selected by type. 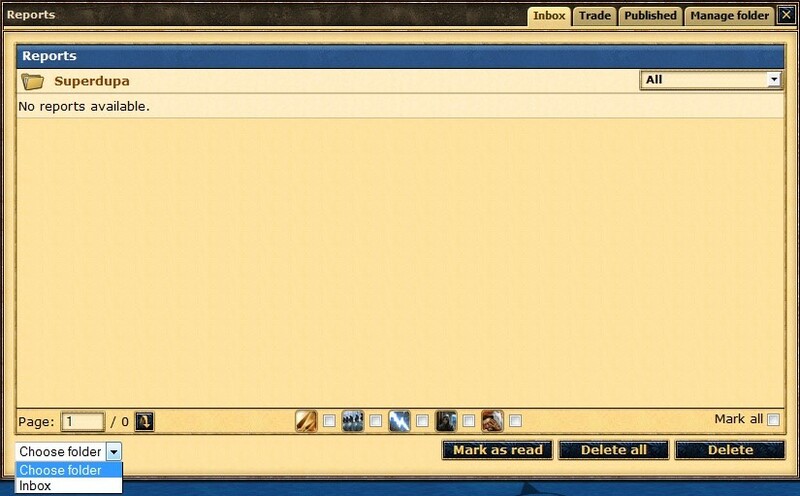 In the bottom-left corner of the window you can find a dropdown list with all your report folders. You can move your selected reports if you select one of the folders of the dropdown list as well. You're able to implement your documents from Google Docs as a window directly into the game. 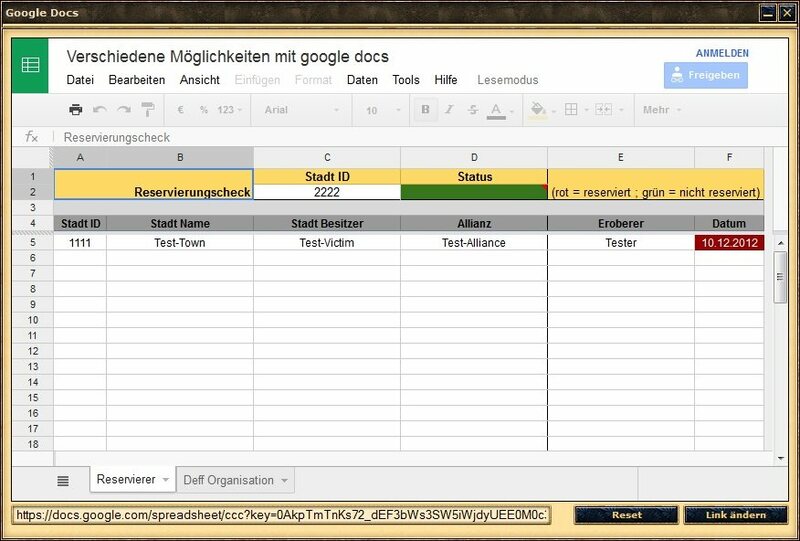 Share the link to your document with your fellow alliance buddies so you can work on your plannings, spreadsheets, lists, etc. together. 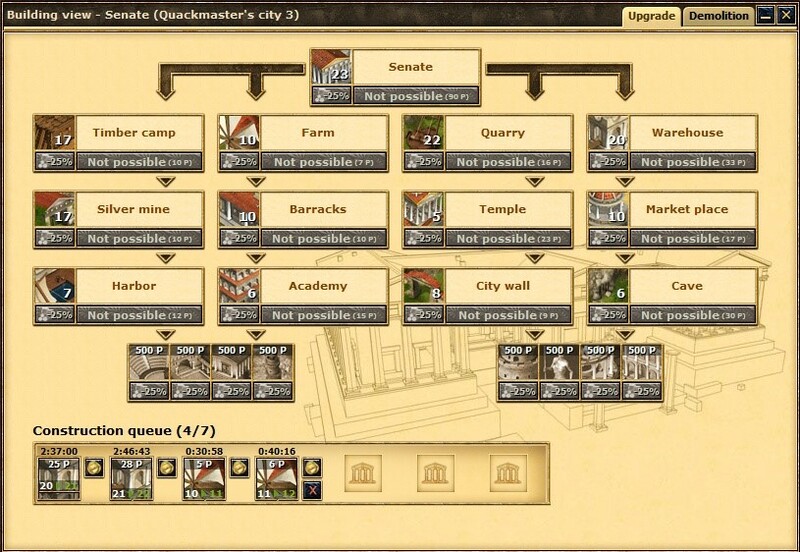 A dropdown menu with different filters is added to the overview. You can search for certain paramenters as well. All silver above 15.000 is automatically added to the input field of every city. There are many hotkeys for different features of the game. You can find a list of all hotkeys if you hover over the HK image next to the tradeoverview list. 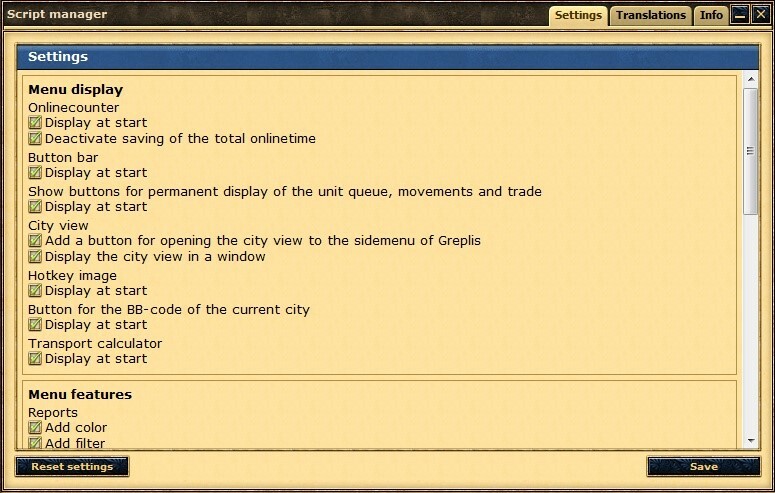 The window of the island overview gets a new look to make more place for the town list and farming villages list. Playernames are also changed to clickable links which open their player profile. A button is added to write a message to all island inhabitants. 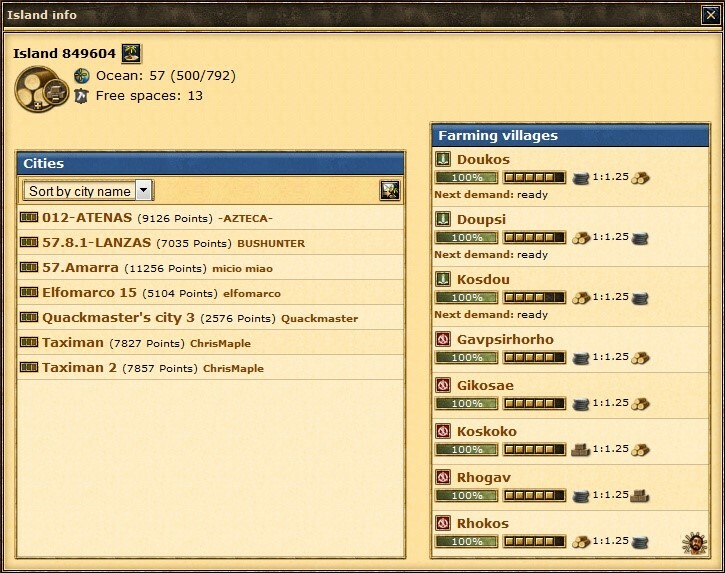 A display next to the townname indicates how active a player is (based on his recent gain in city points and bashpoints). A display shows how many city festivals, Olympic Games, victory procession and theater plays are currently possible. Cities get sorted to the beginning of the list, if there are a festivals, games or processions possible. 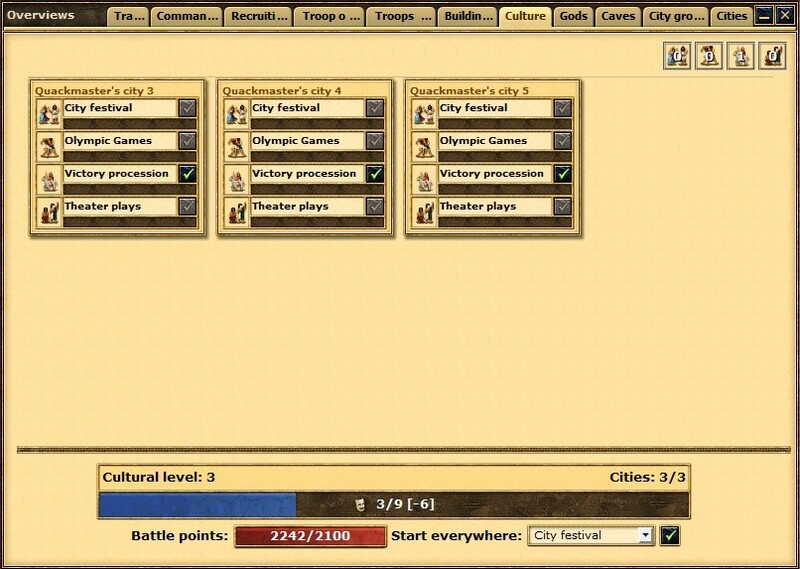 You can also see how many culturepoints are still needed to gain the next culture level (culture points which are currently in progress are added to the calculation). Points for the next building upgrade are added to the senate. This is the control center of the script. Here you can (de)activate most features of the script or tranlate it to another languate. This info to also shows your currently installed version of the script and gives you other important (contact-) information. 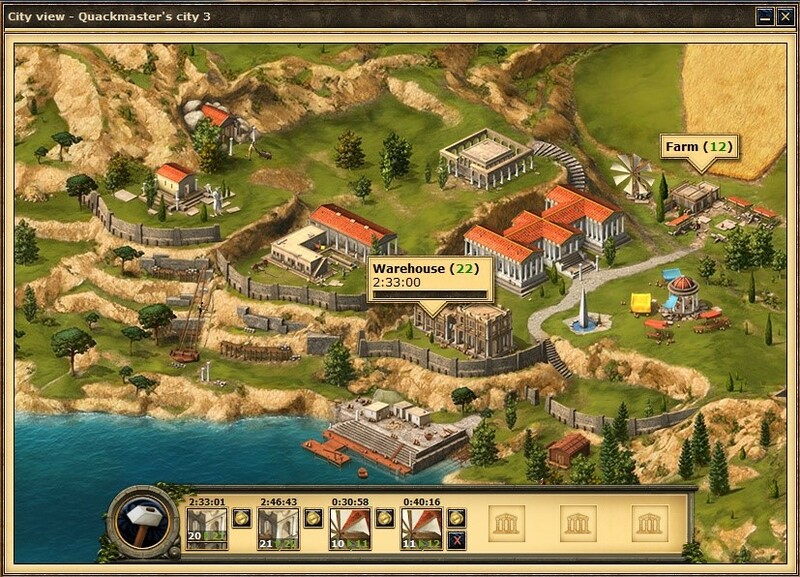 A button to jump directly to a city on the map is shown, if you hover over a town name. 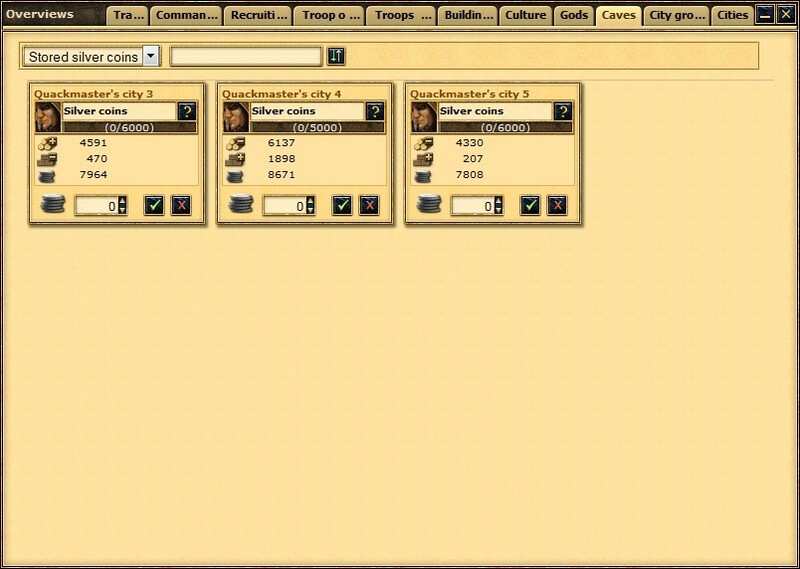 There are also buttons to export all cities to BB-Code. The cityview can be opened as a window instead of a the fullscreen overview (like it used to be before the changes). There is also a button added to the sidemenu on the left to open the cityview. 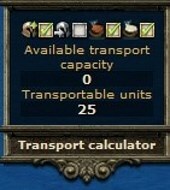 The transport calculator gives you an overview over how many population points are used by your units and how many population points can be transported by your ships. All units and ships which are currently build will be added to the calculation. There are some options to exclude different paramenters from the calculation. 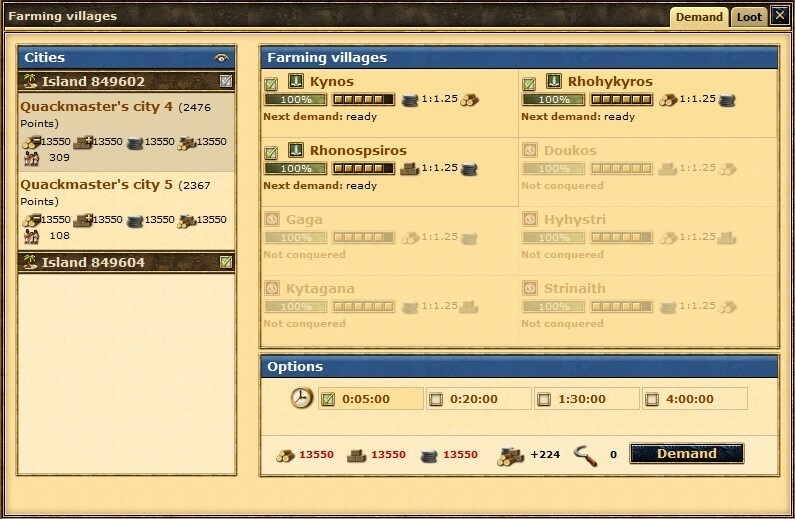 The feature to include units which are stationed outside of your city is currently deactivated due to a bug of Grepolis.